This historic lighthouse at Haig Point on Dafuskie Island dates to 1873. 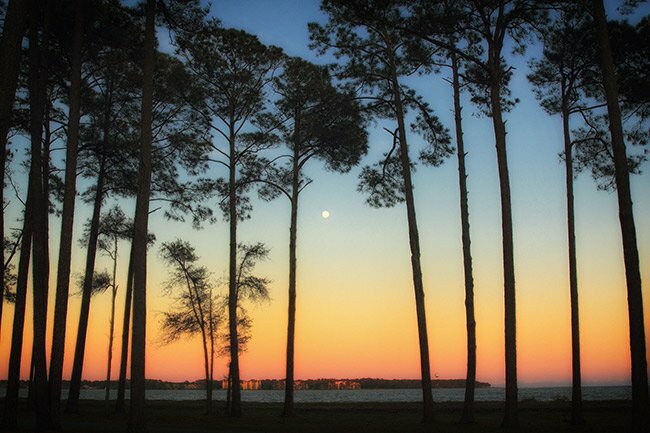 The island itself – once home to a large Gullah population – is comprised of 5,200 acres, much of it rural. 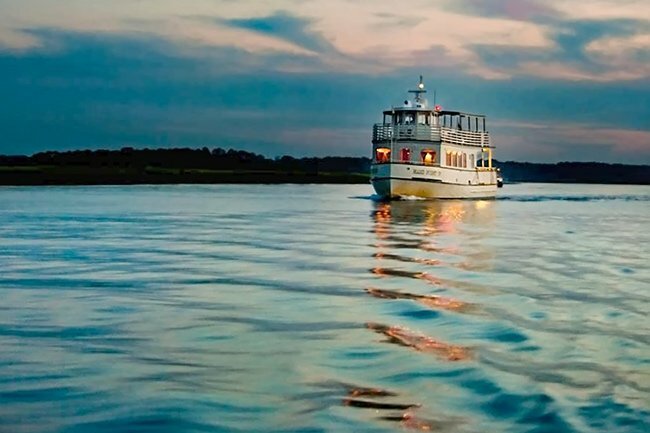 The island is surrounded by two tidal rivers, the Cooper River and the New River, as well as the mouth of the Savannah River. People can reach Dafuskie Island only by boat. The northeast portion of the island was purchased by Scottish merchant George Haig in 1733, who called his estate Haig Point Plantation. The property remained in the Haig family until around 1810 when it was sold to David John Mongin. After Mongin’s death in 1823, it fell to his widow, Sarah, and in turn her second husband, Heman Blodgett. (Many accounts refer to him as Herman, with an r, but descendants say his name was actually Heman) Blodgett built a plantation house on the point as well as tabby slave quarters. Blodgett then sold the estate to the Squire Pope in 1850. 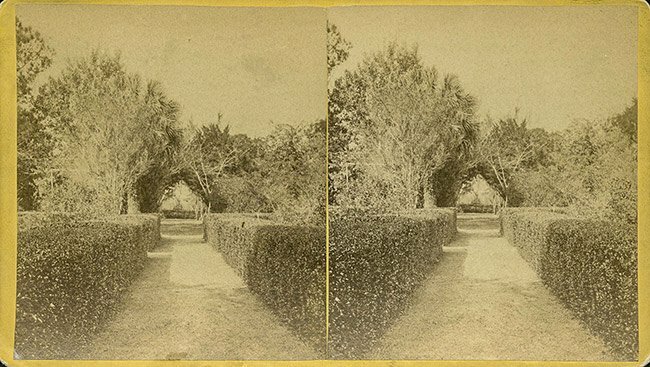 The photograph below is of an early garden view of the plantation, one of the only known photos to exist. The island had seen strife during the Yemassee War and the Revolutionary War. In 1861, soon after the Civil War began, Union troops spotted the grand home on their way to Savannah and burned both it and the slave quarters. 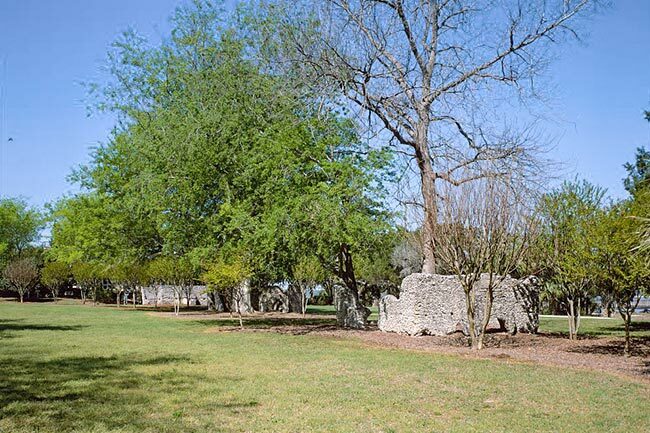 The slave village stands out from others because of its unusual curved layout over the standard rectangular placement. The three remaining slave structures, in ruins, can be seen below in their original placement. The photo below is a closer view of the tabby material used to construct the cabins. Tabby is a mixture of shell (an aggregate), lime (often made from burnt shells which serve as a cement), and water. It was put up in forms and allowed to harden. 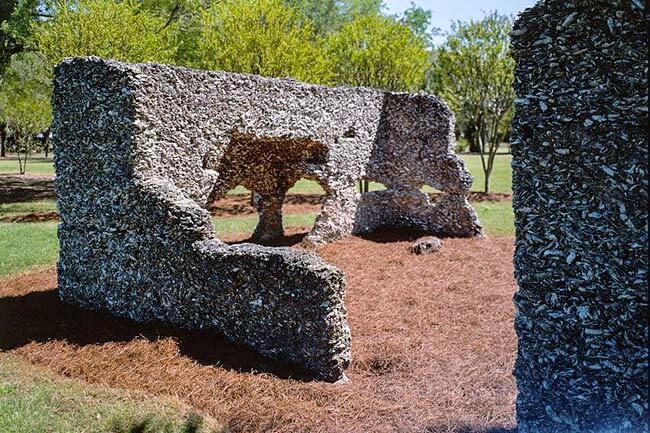 During the eighteenth and early nineteenth century, Lowcountry planters used tabby to build not only their own dwellings, but also slave houses, dairies, barns, fences, and even some grave monuments. Tabby was used not because it was easy or particularly convenient, but because brick was in such short supply. In 1871, the federal government purchased five acres of Pope’s land for the purpose of establishing a lighthouse. The Haig Point Lighthouse was in operation by 1873, first lit by caretaker Patrick Comer. The lighthouse, a frame building that included a residence for the light keeper, operated until 1925. When it was decommissioned, M.V. Haas bought the building, along with its surrounding five acres. In 1965 the property – including the lighthouse – was purchased by George H. Bostwick. Bostwick had purchased the former plantation in 1961, and through these two land purchases was able to rejoin both parcels of Haig’s original estate. He restored the dilapidated lighthouse in 1967. The International Paper Realty Corporation bought the property in 1984 and developed a private residential community called the Haig Point Club. An archaeological dig commissioned prior to development revealed that the foundation of the lighthouse was actually a tabby wall of the former Blodgett mansion. A fireplace from the house was discovered beneath the lighthouse kitchen. Haig Point, like the rest of the island, is only accessible by boat. A public ferry serves the majority of the island but a private ferry, seen below, serves residents and guests of the Haig Point development. The private ferry operates on its own private schedule. Today, the Haig Point Club is one of two resorts on Dafuskie Island; the other is called Dafuskie Resort, Melrose on the Beach. The lighthouse is owned by the Haig Point Club and serves as a popular event site, even accommodating overnight guests. 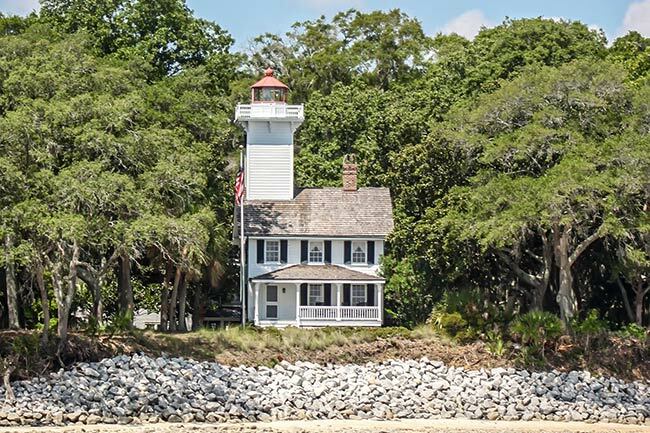 Daufuskie Island Historic District includes the geographic entirety of this South Carolina sea island. Accessible only by boat, Daufuskie contains 5,200 acres of mostly high dry land. The district’s character is defined by eighteen properties of particular historic and/or architectural note, and fifty-six contributing sites or structures. Wooded tracts account for another 167 contributing properties. Most of the buildings consist of folk housing, which is concentrated in two building complexes, both on the island’s western side. They were constructed from 1890-1930, but reflect a much earlier building technology. They are significant architecturally as a survival form. The buildings also include educational, religious, and public buildings which serve the whole population. 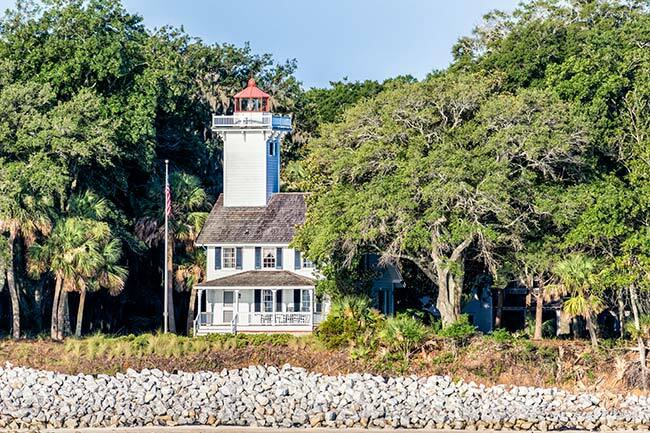 The design of Daufuskie’s two lighthouses has architectural significance in its structural combination of a functioning lighthouse with living quarters. Other areas of significance are historical in nature. Military engagements of note during the Yemassee and Revolutionary Wars took place on Daufuskie. In addition, buildings, sites, and structures represent Daufuskie’s antebellum plantation society based on the cultivation of long staple cotton as well as the history of the island in the early twentieth century when life revolved around the oyster industry, logging, and truck farming operations. Daufuskie’s cultural resources illustrate a three-century long history (ca. 1700-1930) that has evolved with a minimum of outside influence. Hopefully I will be able to visit all the lighthouses of the Carolinas. Was browsing lighthouses today and came across this one which I find fascinating. So much history.